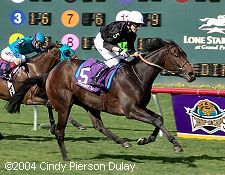 Note: Winner of the 2004 Breeders' Cup Filly and Mare Turf and second in 2005, she won again in 2006. She also won the Nassau Stakes at Goodwood and the Prince of Wales's Stakes at Royal Ascot, and was 2nd by a neck in the Irish Champion Stakes at Leopardstown. Shipped over to Japan where she was 3rd in the Japan Cup then went to Hong Kong where she was injured in training for the Hong Kong Vase and had to be retired.